Even he knows where this album ranks. It’s no small let-down when the best track on an album is the worst reading you’ve heard of a great song. 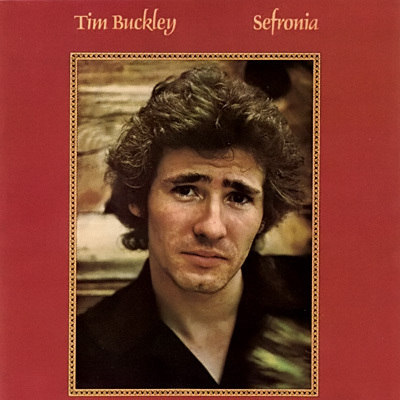 Said let-down, Tim Buckley’s histrionic, fussy, and altogether overblown performance of Fred Neil’s “Dolphins,” unfortunately leads off 1973’s histrionic, fussy, and overblown LP Sefronia. I’ve written about That Voice in earlier posts when discussing Big Mama Thornton, Sandy Denny, and Harry Nilsson (and how the last squandered part of his via hard living and an odd/related case of coastal narcolepsy). Tim Buckley, with his enormous range and interpretive talents, ranks high on my list of extremely gifted vocalists. He can transport you to another place and stir emotions like few others, and he’s accomplished this on the strength of both his own and others’ material. But his overproduced take on “Dolphins” proves emblematic of what’s wrong with this album. The back-up singers in “Dolphins” startle with their cheesiness in the chorus (“searching…”), so much so that it’s almost funny until you remember that this isn’t a joke. It’s a very beutiful song that requires delicacy and restraint. But Buckley’s golden pipes are bursting with overwrought. And, seriously, who thought church bells were necessary for the fade-out choruses (“this old world will never change…”)? It goes further downhill from here, and at a frustratingly leisurely pace. “Peanut Man” reminds me way too much of Harry Nilsson’s “Coconut” (“rum and Coca-Cola” versus “de lime in de coconut”), a song that I’ve never been able to tolerate, even though I’m a big fan of Nilsson, even when he’s getting schticky–at least that was always part of his style. Schtick just doesn’t suit Buckley’s performing prowess or compliment his back-catalog successes. In all, from tempos to themes, laziness seems to be the operating mood of the album, and this fact can’t be hidden under layers of instruments, back-up singers, or Buckley’s own theatrical attempts at kicking things up the several notches that this weak-tea material requires. It gives me no pleasure to say it, but the Starsailor’s muse seems drydocked here, though less so than on 1974’s tired-sounding Look at the Fool, and his life would be cut short by an overdose before we could find out if he would ever launch full-sail again. Newcomers would be better served checking out any of his records from 1966’s selft-titled debut to 1970’s Stairsailor. For a much better version of “Dolphins,” check out this gorgeous, de-cluttered live version on YouTube. Don’t start here, friends. This is the end of the line, and perhaps in more ways than the obvious. “Lifestyles catching up,” indeed.